Lamplighters recently had an extremely busy week starting with an International Evening in conjunction with a local church on Saturday 13th October organised by Lamplighters Mary James and President Clyde Raine.Using a grant from the High Sheriffs Police Trust the evening was a superb example of people from different religions and cultures working together to showcase their traditions and food in the hope of peaceful relations between all. Amongst the many great performers was one of the few balalaika ensembles in the UK, the Karina Balalaika Ensemble and the colourful Adehyeammatpe Cultural group from Ghana, one of whose members is a Lamplighter. A local pop up food outlet, The Rockin Buddha, fed all the audience and performers with high quality delicious vegan food from their van outside the church whilst inside the church many of the cultural groups gave tasters of food from their native countries. On Wednesday 17th October the club hosted a Paul Harris Fellows Presentation Evening organised by Najib Yousif in the presence of PDG Eric Cowcill. Wonderful entertainment was provided by two excellent classical guitarists Ed and Jo. The three extremely worthy recipients were Lamplighters Philip Smith and Nan Ironside plus Julie Harradine Lee for her work with children who have additional needs. The last day of the week saw Lamplighters out in force with other local community groups and pupils from St Johns CE Primary School. 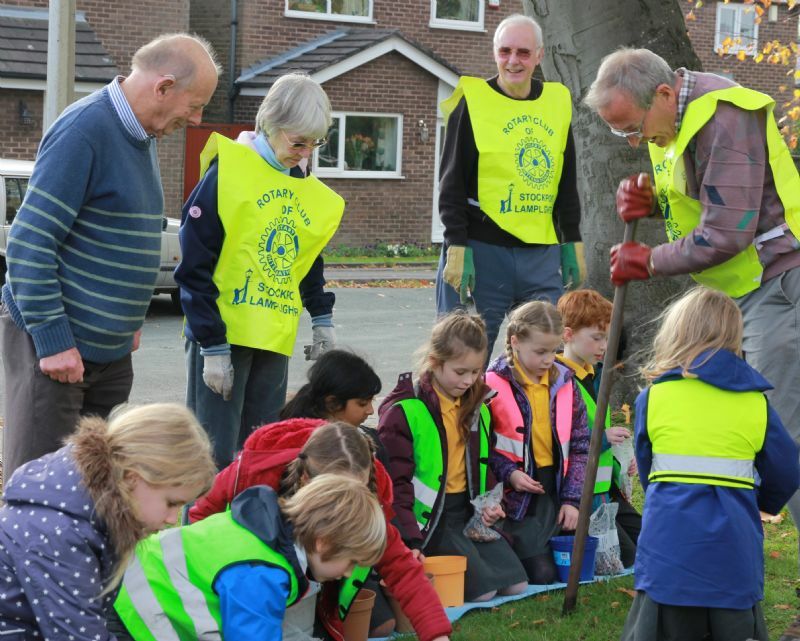 Organised by Lamplighter Mary James they planted over a thousand crocus corms on a busy A road through the Heatons which will eventually have a Rotary sign posted there telling all about Rotarys aims to eradicate polio.